Join us as we talk to Dr. Anna Cabeca, an expert in women’s health and functional medicine, about fertility! We discuss what fertility/infertility means and signs to look out for, why we are seeing so much infertility, things the partner can do to increase his fertility, aging and fertility, stress and infertility, how to talk to someone struggling with infertility, and a whole lot more! You’ll learn valuable tips, supplements ideas, and changes you can make to your lifestyle TODAY to have a healthy baby. Dr. Anna Cabeca is an expert in Women’s health and Functional Medicine. She is an Emory University trained, board certified Gynecologist and Obstetrician, and board certified in Anti-Aging and Regenerative Medicine. She specializes in bio-identical hormone replacement therapy and natural alternatives for optimal aging and high performance. She has literally traveled around the world to find the best natural solutions in health. Her belief is that the advantages of creating health and hormone balance not only improves our own health, but also improve the health of generations to follow. [7:27] What makes a woman fertile? What are signs that a woman is fertile or could possibly be subfertile? [15:20] Why are we seeing so much infertility/subfertility these days? [16:50] How often is infertility an issue with the male partner? What are some things that could cause male infertility? [20:51] How much truth is there to the saying that it's harder to get pregnant as you get older? [24:14] How much does stress contribute to infertility/subfertility? [46:08] How do you respectfully talk to someone struggling with fertility? Join us to get many useful tips and wisdom from Stacy Toth, from the Paleo Parents. In this interview, you'll learn concrete ways to help transition your family to a real food based diet, how to eat real food while on the road, how to prioritize self-care even for moms and a few tips for breastfeeding moms. Please share your own tips and comments below, we'd love to hear from you! Husband and wife, Stacy Toth and Matthew McCarry blog together at the popular website, PaleoParents.com. They co-host and produce the top rated syndicated podcast, The Paleo View as well as authored bestselling cookbooks, Eat Like a Dinosaur, a recipe & guidebook for gluten-free kids, Beyond Bacon, Paleo Recipes that Respect the Whole Hog, and Real Life Paleo,Recipes, Meals, and Practical Tips That Follow an Easy Three-Phased Approach to Health as well as two eBooks: 3 Phase Paleo: Transition Your Family in Three Easy Steps and Paleo to Go: Meals & Snacks for Work, School and Travel! They and their award-winning recipes have been featured in several national publications, television, radio shows, podcasts and many sites online. 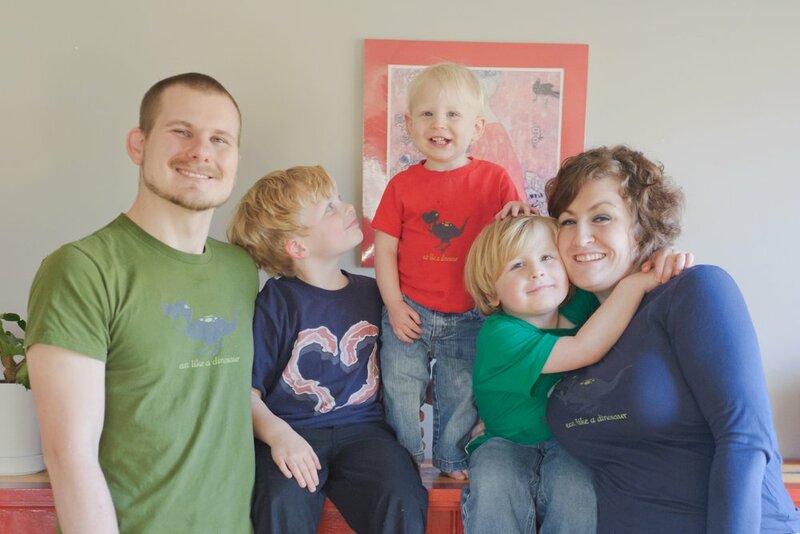 In addition to writing on topics related to paleo parenting, Stacy & Matt are well-known for their candor and openness in addressing topics related to having changed their whole family’s health with a paleo lifestyle. This includes living without a gallbladder, depression, the auto-immune protocol, still being the fattest people in paleo after losing 200lbs, becoming a strong athlete after a lifetime of obesity, and everything in between. Stacy is also a competitive Strong Woman.